Dubai: Investors no longer need to choose between a home and a small office in Dubai as developers are coming up with ways to combine both features for the price of one. It doesn’t stop with that — developers could also offer multi-year business licenses along with visas for the family. Emaar has just released its Park Ridge apartments at the Dubai Hills community in Mohammad Bin Rashid Al Maktoum City. These are priced from Dh1 million. Market sources say it is unlikely Emaar will be the only developer with such a format in its portfolio. Abu Dhabi last year announced that start-up business owners can have the flexibility of operating from their residences for a fixed period, if they so choose. The laws would be changed to accommodate both needs through a single address. The thinking is anyone who can afford to spend above this on their home could well have the funds necessary to set up independent offices. Given their niche status, such “home-offices” will attract end-user buyers predominantly. While buyers can still rent out the residences, the business license is non-transferable. Dubai already had the concept of “flexi-offices” and accompanying visas at its free zones. What developers have done now is marry that flexi-desk licenses into a residential concept. In fact, “sharing” could well be the theme developers will push this year, hoping buyers will snap up the proposition. Emaar and Nshama have launched “co-sharing, co-working” concepts at their Dubai Hills and Town Square developments. The concept is quite straight-forward — property owners or tenants can base their residences and offices within the same building or vicinity, and not have to bother with travelling sizable distances between the two. The office space too will see more of the shared concepts being offered by developers/landlords. Already, Dubai has made some headway in getting connected to this global trend. 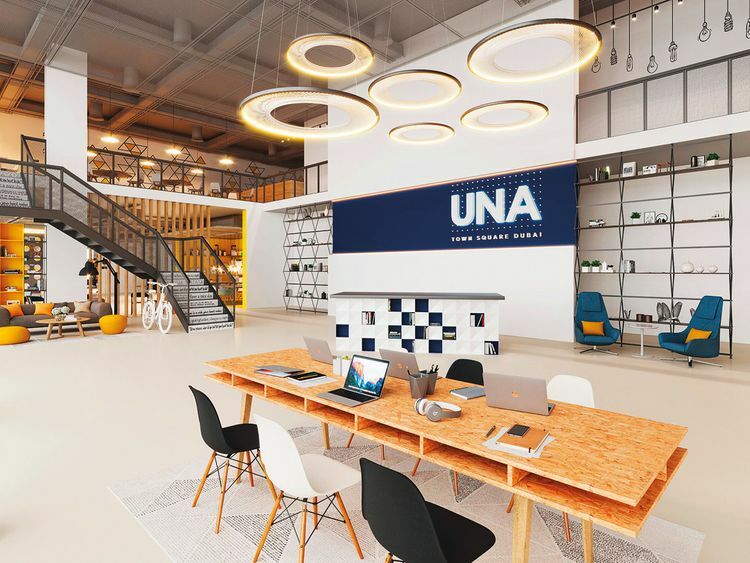 “In 2018 the number of co-working and serviced office space projects rose to 70 [offering a combined 69,000 square metres] from only nine [30,000 square metres] in 2010,” according to the latest JLL update on real estate trends in the UAE. “The concept of flexible office spaces remain popular as occupiers focus on new ways of working and driving cost efficiencies. The UAE authorities have been introducing new initiatives or updating past ones to pump in more energy into the various sectors of the economy, including, of course, the real estate. Flexible visa requirements for various types of investors are among the announced ones. “The prospects for 2019 will to some extent depend upon how quickly the regulatory changes enacted last year begin to generate additional demand,” said Craig Plumb, Head of Research at JLL’s Middle East and North Africa operations. “While market conditions are likely to remain challenging, investors and occupiers have the opportunity to introduce new strategies to enhance their performance. What could be in store for UAE real estate this year? * “In 2018 Dubai’s retail sector remained the most challenged because of an increase in oversupply and the rise of e-commerce. Mall owners will have to pave the way for the increased trend of ‘shop-entertainment’ and ‘eater-tainment’ as food and beverage concepts are now successfully replacing traditional retail outlets,” according to JLL. * With the rise in e-commerce, there is a simultaneous surge in the demand for more specialist facilities including warehouses”. * Last year saw a surge in the selling of hotels, and this is likely to “continue into 2019 as operators seek to move to a more asset-light model and investors gain increased confidence from improved levels of market transparency from recent arm’s length transactions. Other features of the market in 2019 are likely to include more rebranding announcements, with just over 50 per cent of Dubai hotel rooms currently managed by major international brands”.